A flood of IT innovations such as data center virtualization, optimization and automation, while greatly beneficial, have also brought diverse solutions and physical and virtual challenges to today's data center infrastructure. The best response to these new challenges is effective IT management. Effective IT management requires a vendor-independent platform and centralized data center management capability. 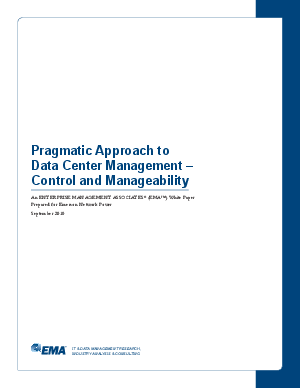 Enterprise Management Associates (EMA) explores a pragmatic view of data center management in order to deliver the best practices in real-world data centers for over-arching management solutions. This will enable interoperability of managed entities across physical and virtual boundaries and help IT to control costs and manage diverse, complex technology environments while achieving core objectives for availability and security.